The Republicans have been screaming about “Radical Islamic Terrorism” for a long time now. Meanwhile, they ignore greater threats. Yes. Greater threats, like Climate Change or non-Muslim Americans killing other Americans. They were real slow in responding to a white guy shooting up a Planned Parenthood clinic. Why? Several reasons but the main ones being, they are waging a Smear campaign against Planned Parenthood, the shooter is white, the shooter is a Christian, and mostly because the shooter shares a lot of their core values. They almost tripped over each other to respond to the shooting in San Bernardino. That’s because the shooter is Muslim and he’s brown. The Colorado shooting by a white, Christian, Fundamentalist occurred on a Wednesday. The GOP candidates waited until Saturday to make statements. It’s been one day since the California shooting by a brown Muslim and the candidates have spoken. Let’s compare. Chris Christie on Colorado: I can’t find anything but he probably offered a prayer. He did have a tiff earlier this year over Colorado’s pot law. Maybe he felt a comment would be awkward. Chris Christie on California: “We need to come to grips with the idea that we are in the midst of the next world war.” He also said it was the “first” terrorist attack on U.S. soil since 9/11. I guess he doesn’t consider any gun violence terrorism and didn’t read a newspaper the week of the Boston Marathon bombing. Jeb Bush on California: Praying for the victims, their families & the San Bernardino first responders in the wake of this tragic shooting. The Republican main brand is fair and this is another opportunity for them to sell that. Toward a solution, all the candidates have are prayers and a rush to hate Muslims. Neither is helpful or a solution to Americans shooting Americans. The New York Daily News is catching a lot of heat for illustrating as much on their front page. But praying while adding nothing else doesn’t change anything. Go ahead and pray for people. Despite some conservatives acting wounded over the prayer criticism, it’s not enough. 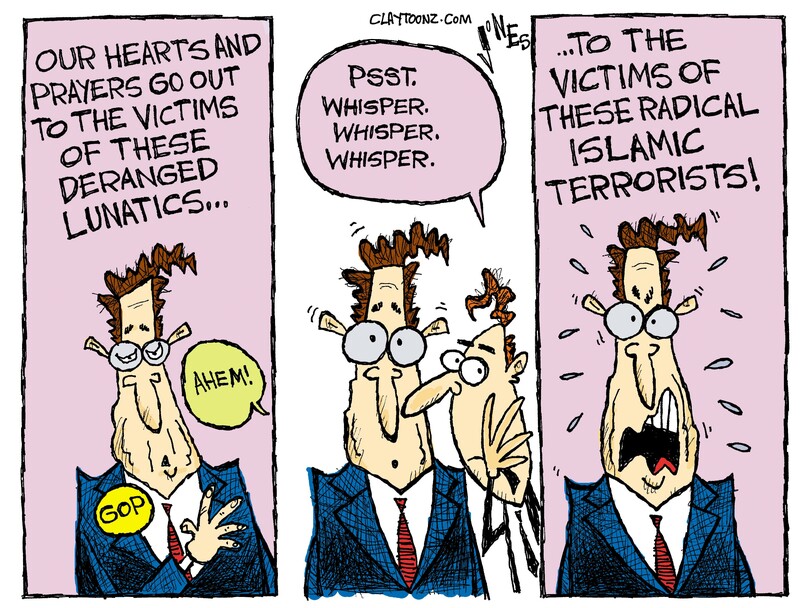 Isn’t it just like conservatives to play victims over praying being criticized after 14 people were just killed? How about in ADDITION to prayers (I said “in addition” you overly sensitive cry babies), proposing some solutions? How about actual legislation other than another bill to defund Obamacare? 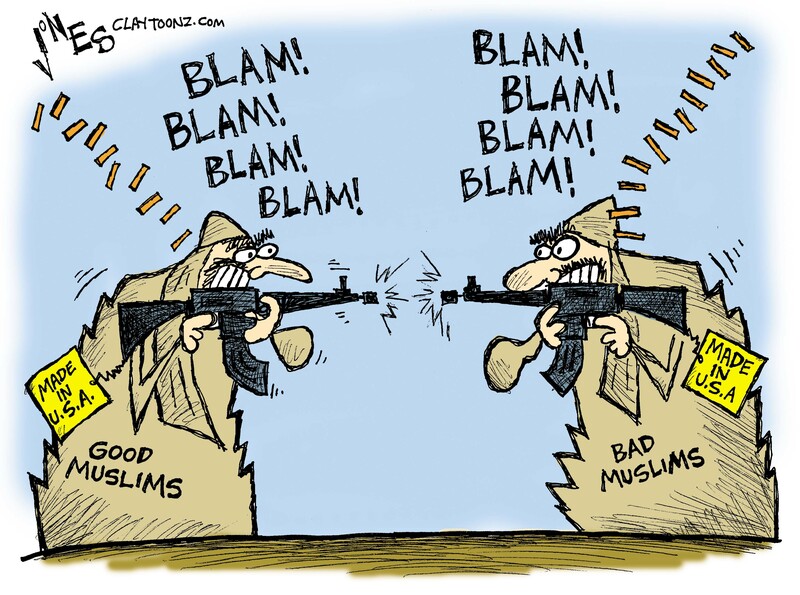 Focusing on prayers and Islam isn’t stopping gun violence. Remaining silent over one shooting and taking a political advantage over another isn’t helping either. The solution is fewer guns. Fewer guns for you. Fewer guns for me. And most importantly, fewer guns for bad guns. Seriously, it’s all empty rhetoric if you aren’t helping to keep guns away from terrorists, whether they’re domestic, foreign, Christian, or Islamic. House Speaker Paul Ryan is against not selling guns to people on no-fly lists. We don’t have a problem leaving a douchenozzle stranded in Wichita but we better not violate his civil rights by making him wait on purchasing a gun. This guy is the leader of Congressional Republicans. We’re in trouble. It’s also weird how Republican concerns over Constitutional rights are absent over issues such as hmmm…I don’t know….voting? There are too many guns. That’s the foundation to this problem. Obama is doing a terrible job of rounding up all our guns before the U.N. invasion. I swear I’m not voting for that guy again. People always play the Nazi or Hitler card when arguing politics. It goes for conservatives and liberals alike. It’s one of those “oh no he didn’t.” It gets tiresome and it usually gets you ignored pretty quick. Rightly so. The most recent tiresome example is the comparison of Democratic Socialists to National Socialists. The Nazis were National Socialists and if you know anything about history, there wasn’t anything Democratic about the Nazis. The word “Democrat” isn’t the word to fixate on. I’m more concerned with nationalism. Anyone making the comparison between Democrats and Nazis is just a trolling moron. You might as well say vegetarians want to gas Jews, invade Russia and steal art because Hitler was a vegetarian. Hitler also loved dogs and opposed cruelty to animals. Go figure. Hitler also initiated the Volkswagen Beetle. Driving a tiny car that looks like a shoe and nearly impossible to lose your virginity in does not make you a Nazi. By the way, Bernie Sanders, the Democratic Socialist, is Jewish. 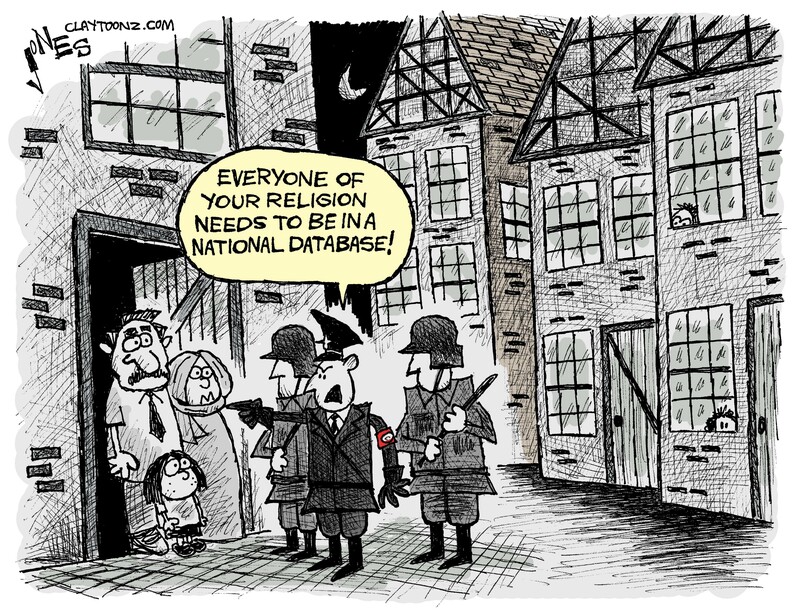 Now Donald Trump and other conservatives are making an argument that Muslims should be entered into a national database. He also says we should shut down some mosques. It always starts with some. What’s up with Trump? Is he secretly a member of Hydra? If he wins the election I predict he’ll rip his face skin off after being sworn in revealing he’s the Red Skull. Are these people serious? Are they unfamiliar with what happened in the past when we wanted to put people on a list identified by their religion? Maybe they are aware and they’re big fans of it. He is leading in Republican polls. How disgusting do these candidates have to get before Republican voters say “hey…I’m not sure about that plan.”? Earlier this week in my community a public hearing was held for a group who wants to build a new mosque. At a town hall meeting in Spotsylvania, in the Fredericksburg, VA, region, two men yelled that all Muslims were terrorists. Police had to end the meeting early because of all the hatred. Never mind the fact the group wanting a new mosque currently has a mosque and has been here for decades and hasn’t been a problem. Oh my God, they’re gonna have a new building to continue doing what they’ve been doing without anything bad ever happening! Somebody stop it! Republicans love to scream that President Obama and Hillary Clinton never use the term “Islamic terrorists” when discussing terrorism from Muslims. A lot of progressives don’t believe an entire religion and culture should be lumped in with the bad guys. The same people who criticize them for that never call out the people that say all Muslims are terrorists. Should we start calling white people who shoot up schools as Christian terrorists? When we look back on history we see that at times the United States was on the wrong side when it came to treating refugees and at times its own citizens. We refused to let Jews come to the U.S., with many dying in the Holocaust as a result. We put our own citizens into camps based on their Japanese race. We ostracized and black listed people accused of being Communists. We were on the wrong side of history. It’s amazing that so many are ready to be on the wrong side again. I’m not afraid of refugees. I grew up surrounded by them. You did too. One of the best men at my wedding was a refugee. Refugees will be vetted. Refugees will not be made up of single men between the ages of 18 and 40. They will mostly be widows, orphans and families. Most of the males will have professional careers. There’s also a very long process to be granted refugee status into the U.S. Congress, which never does anything, voted on a law trying to block refugees from entering the country. How ugly have we become? Even those five Syrian guys stopped in Honduras with fake passports aren’t dangerous. They’re not refugees either. Four are college students and the other is a professor. There are no links between any of them and criminal elements. Conservatives shouldn’t be afraid of college students…unless they’re black and they want a protest. Also, all of the Paris attackers are from Europe. Every cartoon I’ve drawn this week has been on issues that resulted from the Paris attacks. I like to vary it up but the national conversation this week has been all about Paris, Syria, and refugees. I feel like there’s a lot to stand up for. It’s very important we don’t go down that Nazi road. I’m not going to be silent on these matters. There are too many people out there who want to take this country backward. They vote. They’re breeding. If you don’t think it’s a problem that the government goes after Muslims then ask yourself this. Who will they come after next? Did you like this cartoon? Want to help a cartoonist make a living? Look to the right of this page and make a donation through Paypal. I need to buy pens, paper, and sandwiches. The starving cartoonist appreciates it. Mike Peterson at Comic Strip Of The Day used my cartoon today and yesterday. 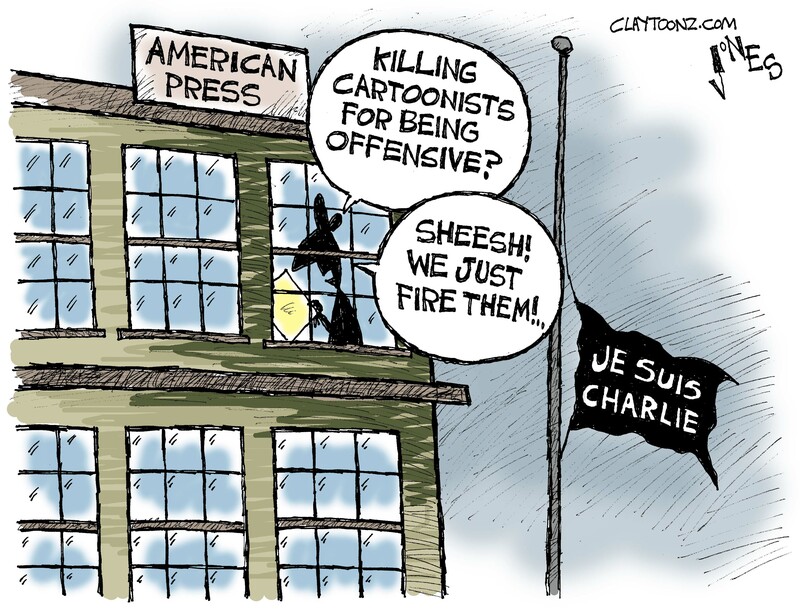 He also used cartoons from Matt Davies and Glenn McCoy as examples of free speech. Once again he wrote an excellent article. A lot of people think it’s an editorial cartoonist’s job to offend. I don’t agree. Several years ago after a Dutch newspaper incited wrath and death threats from Islamist extremists for running a bunch of cartoons depicting Muhammad, my employer debated running the same cartoons. It was our oped editor’s idea. The editor of the newspaper called a meeting of the oped editor, editorial page editor and myself (being a cartoonist he thought I might have some experience with the matter). The editor was really surprised when I voted against running the cartoons. He thought I would love any opportunity to be offensive. Not at all. I explained my position to him, which also gave him a course in what a political cartoonist’s job actually is. I explained that running the cartoons at that point was not making a statement. Running them would only serve to offend. A good cartoonist, or any satire, is not to offend people. It’s to put out a viewpoint that makes people think and often challenge readers. If a reader chooses to be offended then that’s a byproduct, a byproduct no publication should be afraid of. If a cartoonists is only working to offend then he’s not a cartoonist. He’s a troll. But many are afraid of offending readers. A few months ago a client of mine in Tennessee canceled running by cartoons because they were in a military community and they received too many nasty letters. No death threats, just threats to cancel their subscriptions. The editor said he loved my work but he couldn’t continue to incite outrage among his conservative readers. I’ve received the same message from other editors (a lot in Texas). I’ve even had editors ask me if I could change my viewpoints (they’re in Arizona). Here’s my point with this cartoon (in case it’s not clear): a lot of American publications and their editors are cowards. Death threats are rare in the U.S. But it doesn’t take a death threat to scare an American editor. Tell them you’re going to tweet something nasty. I do continue to have clients that are not afraid of strong cartoons. Thanks to all of them. I had one in Las Vegas write me this week that my cartoons have inspired several letters recently and that I need to keep it up. I love editors like that. Now if only more newspapers would hire cartoonists.